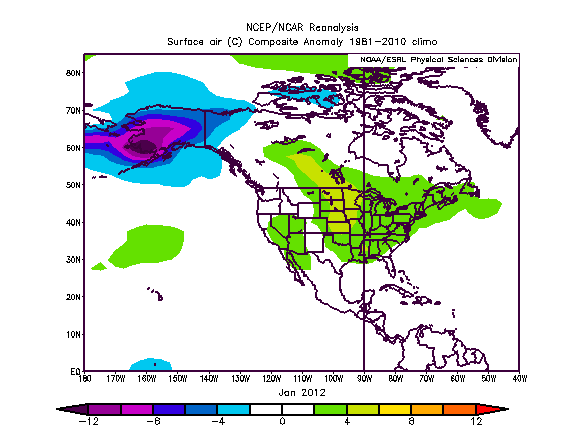 Below are the temperature anomalies for January 2012 — if one were to produce a December 2011 or February 2012 map, it would look similar, as the same general temp pattern has prevailed. Note the large expanse of warmth virtually everywhere – very little in the way of thermal gradients/temp contrasts. As a result, short waves have been relatively weak, and unable to produce much snow in the Great Lakes/Northeast. Furthermore, without strong low pressure systems, cold air cannot pour southeastward, and Lake Effect snow has been absent for the most part b/c of this. No polar outbreaks –> no lake effect snow, and no strong cyclones –> no arctic outbreaks in the Northeast. 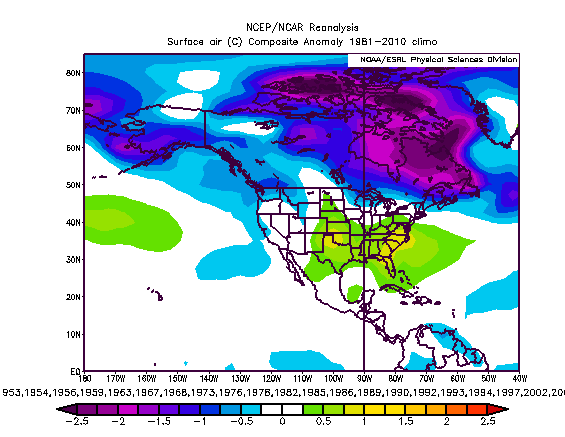 It’s been a benign, boring, winter from a meteorological stand-point in North America. Not the case for Asia and Europe – that’s for sure. The AO transition in mid Jan yielded the development of a blocking feature on the Asian side of the north pole, resulting in record breaking cold and snows across Eurasia, down to Rome, Italy. As we move into the future, that pattern is changing, with a rise in AO values into the positive territory, meaning a return to lower than normal heights in the northern latitudes. What it also means is arctic air will FINALLY enter our side of the globe, with Canada becoming drastically chillier over the coming week. Note below, the 10 day temp anomaly forecast for Canada. A major change from the map posted earlier. Believe it or not – COLDER THAN NORMAL AIR will overspread most of Canada in the week 1 to week 2 period. Unfortunately for the Northeast, a positive AO and NAO also means the Southeast ridge is robust, and one can see by the warmer anomalies in SE Canada, the resistance to this arctic air. The above image is the 8-10 day ECMWF and GFS model forecast. Notice the strong SE ridge, typical of a La Nina, but also the big time negative height anomalies dominating in Canada, and down into the West/Plains. The PNA will be transitioning negative over the coming week, another aspect typical for La Ninas. It seems we’re entering a pattern which is more normal for LA NINA event, one which many of us thought would be present the bulk of this winter. Although we’re going to see temp anomalies reverse drastically in North America, as already mentioned, it’ll be difficult (once again) to get sustained cold into the Northeast. So in a local sense, the pattern for the I-95 BOS-DCA corridor may not change much at all due to the resistance from a strong SE ridge. However, the larger scale North American regime is undergoing that change, which will finally get an intense baroclinic zone going. We’re likely to see numerous, strong low pressure systems propagating SW-NE from the Plains into the Great Lakes/Interior Northeast, which could put down snows in the Plains, Lakes, and maybe interior New England. The inland storm tracks still means no snow for the big cities of the Northeast. Surface temperature anomalies for Marches which featured a weak La Nina in place look like this — note the similarity to the above forecasts, big cold in Canada, into the West, and across the northern tier of the United States. Ridging in the South/East. A similar picture, with cold in the north, warm in the South. The one wildcard is the MJO — tropical forcing now in favorable phases for cold in Northeast, but since other teleconnectors are unfavorable — positive AO, positive NAO, negative PNA, the arctic air is likely to just “bounce” in and out of the region, if we get any at all. More probably is moderated shots of cold air behind storm systems, nowhere near as cold as what the Mid-west/West may see. 1.) Major reversal in North American temp anomalies, with arctic air building in Canada, should yield a strengthening baroclinic zone with powerful lows moving SW to NE across the United States, dropping snow in the MID-WEST, LAKES, and INTERIOR NORTHEAST. Lakes effect snow may get initiated as well. 2.) Continued warm pattern for I-95/East Coast due to the SE ridge and other unfavorable teleconnectors. We’ll see more cold shots due to the stronger lows moving to our NW, but the poor tracks means continued no snow. 3.) Early March regime of cold West/northern Plains/Lakes should prevail. Warmth in the southern plains, southeast and Northeast coastal plain. 4.) Nothing can be ruled out in weather, but chances are against a snowstorm in the I-95 corridor the next few weeks. If it does happen, it’ll be a thread the needle situation given there’s no downstream NAO blocking, or strong ridging in the Western US. 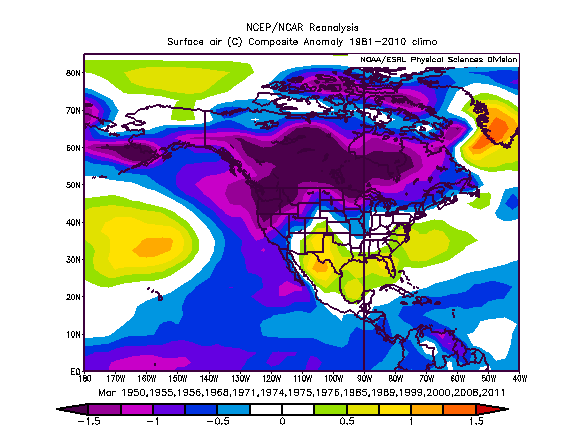 Not much reason to forecast any change in the terrible snow pattern of winter 2011-2012. Will NYC see a 6″+ snow event this winter? It doesn’t look good for the next few weeks, but on the bright side, some more exciting times ahead in terms of tracking weather. Strong lows means big winds, severe weather in the Southeast US, snows to the NW of the storm systems. 5.) At this juncture, March should come in like a lion in the North and West, and like a lamb along the East coast.